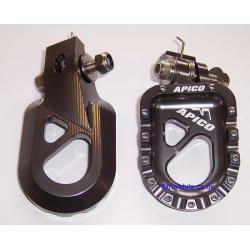 Apico Trials CNC Aluminium Footrests, finished in Titanium (Grey). Complete set to replace your existing footrests, with replaceable studs to help with grip. Very nice quality item, complete with bolts and springs, and even eight extra studs as spares.